The first CAMMAC gathering was the idea of brothers George and Carl Little, along with their wives, Madeleine and Frances. 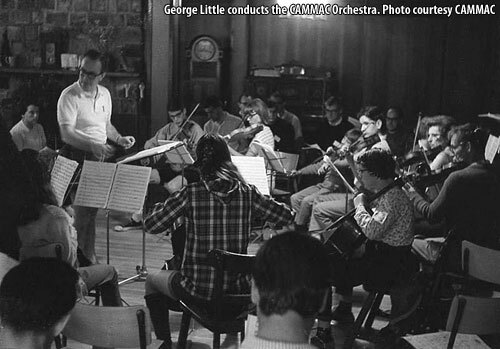 In 1953, the Littles hosted 26 people for two weeks at Otter Lake, where more experienced musicians instructed beginners and participation was always encouraged. “CAMMAC is about people and the pleasure of making music,” says Margaret Little, who was born to George and Madeleine shortly after CAMMAC’s first summer. Turnout grew quickly, with attendance doubling every summer, and in 1957 the addition of a children’s program, which includes sports and crafts as well as music, allowed families to visit together. With steadily increasing enrollment, CAMMAC needed to resettle in a more spacious location. Thanks to a major influx of donations and a loan in 1968, the organization acquired its current home, now the Lake McDonald Music Centre. At the time, the only building was a hunting lodge from the 1930s. While the aged lodge served for a time, CAMMAC once again outgrew itself, and in 2006 unveiled its new main lodge. That construction with its high costs almost broke the organization, but after a few tough years, CAMMAC has recovered. The environmentally friendly building is open year-round, available to rent, and boasts an extensive music library, with over 10,000 scores, and a 240-seat concert hall with a dance floor. It also includes lodging, a cafeteria, and a large veranda with a view on beautiful Lake MacDonald. Twelve small practise studios are scattered around the surrounding forest, where the sounds of rehearsal mix with the music of nature. Events are now held for seven weeks, each week with its own focus, including jazz, Broadway, and folk music as well as orchestral and chamber music. Adults make up about 70% of attendees, as children cannot attend alone, but there are programs for adults, children, and adolescents. On a typical day at CAMMAC, participants wake up to live music in the hallways. After breakfast, there is a brief morning concert followed by a choir class for everyone. Participants then go to their individual classes. Some classes are grouped by skill level, and some, like folk dancing or the Orff Method, are open to everyone. After lunch, there is a “quiet hour” during which no music is played; instead, campers can enjoy a different activity, like swimming, tennis, drawing, or yoga. The rest of the afternoon is free for any activity, including rehearsal or simply making music with friends and family. The evening ends with an after-supper concert . The proceedings are very bilingual, with most announcements and classes given in both English and French. “They’re all making the same music together. Maybe they don’t speak the same language, but they’re all getting along!” Little points out. There’s a big concert on Saturday evening in which everyone performs, leaving “maybe five people in the audience,” says Little. Another big concert happens on Sunday morning, this one open to the public as part of the CAMMAC festival. These concerts have seen the debut of such artists as Maureen Forrester and Louis Quilico, and have also hosted artists like Ross Pratt and the Orford Quartet. This summer, CAMMAC hosts seven weeklong sessions from June 29 to August 17. For more information, visit www.cammac.ca.